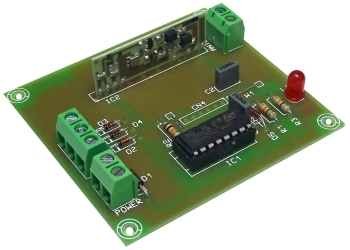 Cebek TL-327 is a dual channel, transmitter which incorporates receiver feedback. The Receiver and Transmitter communicate with each other every 10 seconds. Should the link be broken the receiver will automatically revert to a 'safe' setting. This combination of Receiver/Transmitter is ideal were the device under control cannot be left unattended. (i.e. The operator of a water outlet valve moves out of range the valve will automatically shut off.) It is a Group 3 transmitter and operates on a carrier frequency of 433.92MHz. This transmitter uses an exclusive single identification code. The synchronisation is done by programming the receiver to allow it to recognize identification codes for a maximum of 5 transmitters.